Illuminating your walkway and outdoor pathways with path lighting does not only add elegance to your home exterior, it also ensures safety. When your walkway is properly lit, there is a sense of security and safety. This also provides a safe passage for you and your guests during icy or wet conditions. When there is evenly spaced path lighting, the eyes do not need to adapt to different lighting intensities so a person can conveniently walk along the path and not have to think too consciously about it. 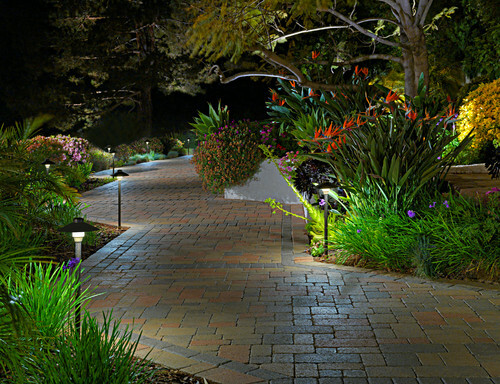 Adding path lights also adds value and appeal to your home and landscape. Here are a few things that will be helpful during your selection process. 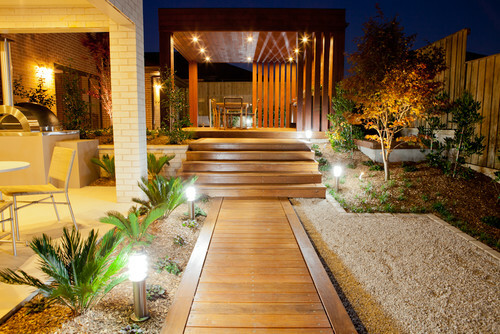 Pathway lighting does not only serve to illuminate but also adds value and appeal to your home and landscape. For a subtle effect, choose traditional fixtures that blend in with the surrounding scenery for an understated passageway. Simple path lights will help create the mood and provide the right amount of illumination you need without overpowering its environment. Develop your home’s exterior by adding the right outdoor lighting that will accentuate or enhance your overall taste and style. Make a statement with your choice of path lighting. Stainless steel or LED fixtures are perfect for updating the facade of your home to look more modern. You can also choose decorative or whimsical fixtures to add visual impact in your outdoor space. It pays to get familiarized with the various types of materials available and how they change in appearance after some time. Path lights that are made of copper, for instance, possess a bright, glossy finish but over time, these will weather to a muted brown and eventually change to a verdigris patina which blends well with brickwork, mulch, and foliage. Weathered copper path lighting looks more natural in gardens unlike other metals or painted finishes, which is why this is the most preferred type of path lighting. Path lights made of brass are a practical option for home exteriors with high traffic because aside from being durable, these are also heavy enough not to be easily disturbed. Brass path lights that have a textured, semi-matte finish usually weather to an ochre shade which goes well with decking and stone, while polished brass path lights have a tendency to weather less predictably into a darker hue. Stainless steel is often the preferred finish for modern gardens. This material requires regular cleaning to remove exterior tarnish and debris. You may use stainless steel cleaners to protect them from brown spotting. Phosphatized steel is another option for steel outdoor path lighting. When steel is phosphatized, its surface is protected from corrosion and wear as electrochemical phosphate conversion coating is applied to it. The lowest cost option for pathway lighting is aluminum path lights. This sturdy material is usually powder-coated not painted. Black is the usual color for most cast aluminum lighting, but these are also available in natural colors, such as bronze and green. Pathway lighting is available in 120-volt and 12-volt fixtures. 120-volt pathway lights do not require a transformer and have no voltage drop between fixtures, which usually occur in landscape lighting systems with long wire runs. Installation costs are higher because a licensed contractor is needed as high voltage lighting is dangerous to work with and installation is more labor intensive. All the light fixtures, wire connections, and other components of the lighting system needed to be completely waterproof to avoid the risk of electric shock. 12-volt pathway lights use smaller bulbs, so the fixtures are smaller and unobtrusive. The light they emit are crisper as they use halogen bulbs. Low voltage lighting systems are safe, easy to install, and do not require an electrician. There is no risk of electric shock in wet or damp locations.